Looking for something special to do this weekend? 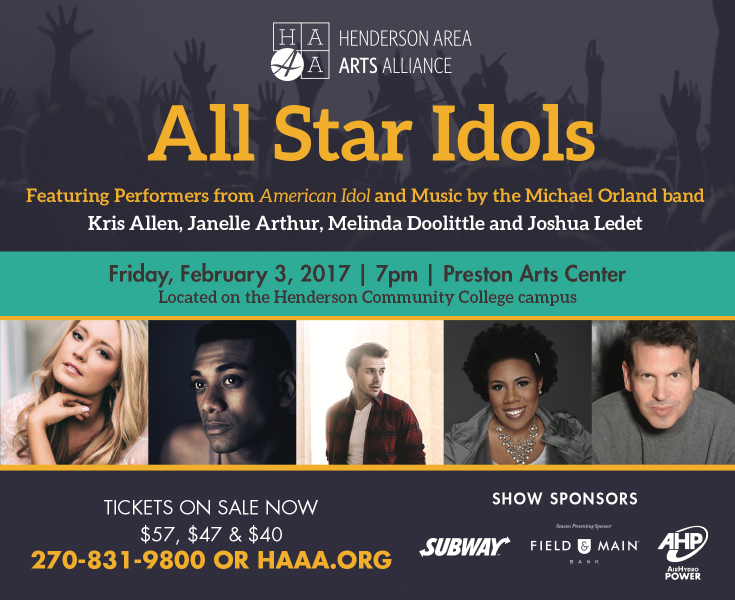 Join the Henderson Area Arts Alliance on Friday February 3rd for All Star Idols! The show will begin at 7:00PM at the beautiful Preston Arts Center (formerly the Henderson Fine Arts Center) located on the Henderson Community College campus. This is a once in a lifetime show arranged specifically for the Henderson area! All Star Idols will feature performers from the FOX hit American Idol. Kris Allen (Season 8), Janelle Arthur (Season 12), Melinda Doolittle (Season 6), and Joshua Ledet (Season 11) will all be performing in Henderson for this signature event. The stellar cast will perform many of their solo hits that brought them to stardom in addition to group numbers. Michael Orland, who is the musical director for Hairspray and was the music producer for American Idol for 15 years, will be coming to Henderson to arrange this wonderful showcase of talent! Never before have these Idols performed together, don’t miss the chance to see this unique display! Also, you won’t want to miss the chance to see several Henderson County High School students in action as they perform before the show in the Preston Arts Center lobby starting around 6:00PM. They are Henderson’s “Idols”! Tickets are $40, $47 and $57 and available online at haaa.org or by calling the box office at 270-831-9800. The Preston Arts Center is located at the Henderson Community College campus at 2660 South Green Street in Henderson, Kentucky. Be sure to join the action and mark that you are going to be a part of history on Facebook. Don’t miss this rare and amazing opportunity to see American Idol Talent in the flesh!